I had not prepared myself for how good the food was on Fred. Olsen Cruise Lines' Balmoral. Each dish was truly something to look forward to, and when paired with excellent company, mealtimes were enjoyable social affairs. Over the course of the cruise, I discussed a lot with fellow passengers over a meal, from cruise holidays to life, money and politics. But the food was the real star of the show. Here is a run-down of what is available onboard daily°. Breakfast was a choice of a buffet or waiter-service across three main restaurants - Ballindalloch, Spey, and Avon. The buffet was expansive and included everything needed for a hearty Full English fry-up, as well as healthier options. The restaurants typically served breakfast between 8 am to 10 am, with the Palms Café regularly open for light snacks between 6 am and 7 am, and then a full buffet option between 7 am and 9.30 am. Times varied on days with early morning shore-side tours. I was just one of small a handful of bleary-eyed passengers in the restaurant when I had to get up at a ridiculously early time to meet for a morning shore excursion to Hamburg. Lunch was a choice between an à la carte menu and a buffet. The restaurants were typically open between noon and 2 pm, with the times at Palms Café staggered slightly to between 12.30 pm and 2.30 pm. Again these times varied slightly depending on the port of call. I took advantage of the complimentary room service to fit in a spot of light work. Room service is available from 10 am to 11 pm on most days and the menu boasts tempting sandwiches, platters, salads, and sweet treats. It usually took 30 minutes for my order to arrive. Portions were generously sized; sandwiches were deep-filled, and the smoked salmon platter would have easily fed two. 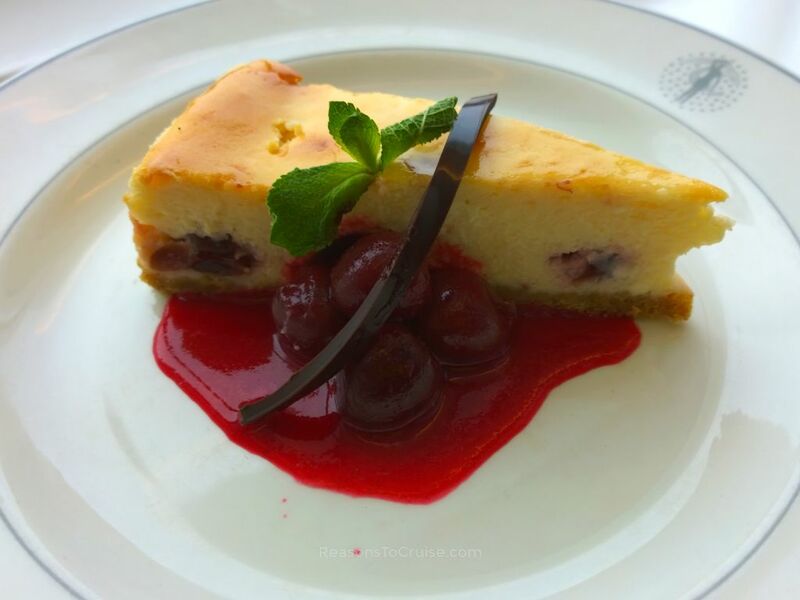 Anyone with a sweet tooth will not be able to resist the temptation of the 'cake of the day' option on the menu. As the name suggests the mystery slice varied day-by-day, from cream layered pastries to flans. The Palms Café was the place to go for a buffet dinner although I preferred to dine with my fellow guests in the Spey Restaurant where my allocated seat was on a table of six. It was a smaller, more intimate affair than the larger, busier Ballindalloch Restaurant. We gathered around a table on the first night as strangers and friendships formed over great food during the sailing. Over the course of just one week, we had put the world to rights, established newly-improved bucket lists, discussed our cruising history, and learned a lot about each other's lives. Be it luck or a spot of good planning by the Maitre D', the table comprised only of solo travellers. A pair were cruise virgins experiencing life at sea for the first time while the other three were widowed, taking their first solo cruises. During sombre moments they recounted very fond memories of travelling the world as couples and explained tactics for dealing with a lonely heart. One passenger, who admitted she had second thoughts about cruising alone on the first night and was close to disembarking, quickly made friends with fellow solo travellers. It must have worked as she booked her next cruise before leaving the ship. Another explained how she was actively avoiding shore excursions that she would have taken with her husband to avoid bringing up painful memories. As for the food, the menus were interesting and varied yet uncomplicated. Gone were the complicatedly-named dishes along with all sense of pretension. 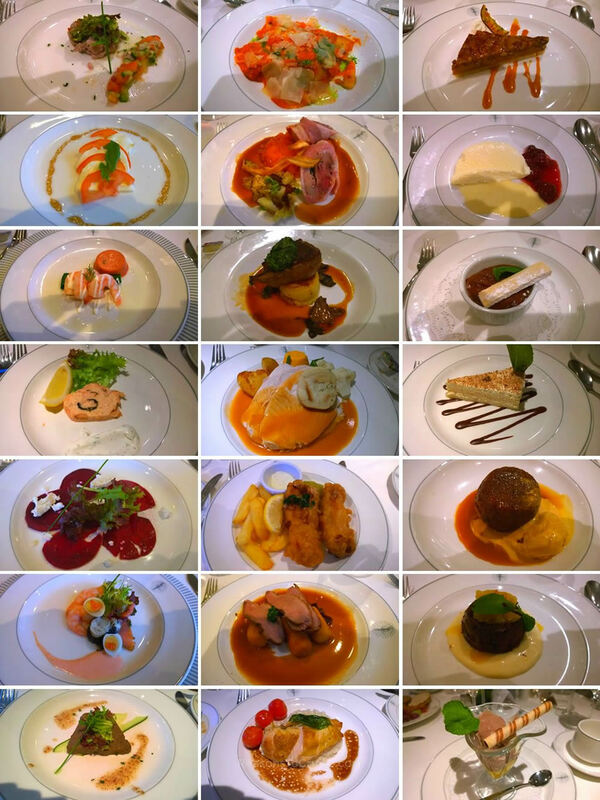 Instead, each night we had a choice of good, honest food that was perfectly cooked and beautifully presented. Fussy eaters and those that disliked the available options could instead choose from a set of standard main course dishes available nightly. These included grilled fish of the day, grilled chicken breast, omelettes, and pasta with a tomato ragout. Most nights also featured a British-style main course for those who preferred home comforts while out at sea. These included dishes like a mixed grill, pheasant in cider, braised oxtail, and bangers and mash. On British night, the menu comprised entirely of traditional national dishes, including fish and chips, chicken tikka masala, roast beef, pork and leek sausages, and a Ploughman's dinner platter. Vegetarian options were available nightly, as were healthier options. One of the guests on my table had a gluten intolerance, and by placing an order each night for the following day, the chefs could ensure her dishes were adapted to be gluten free. 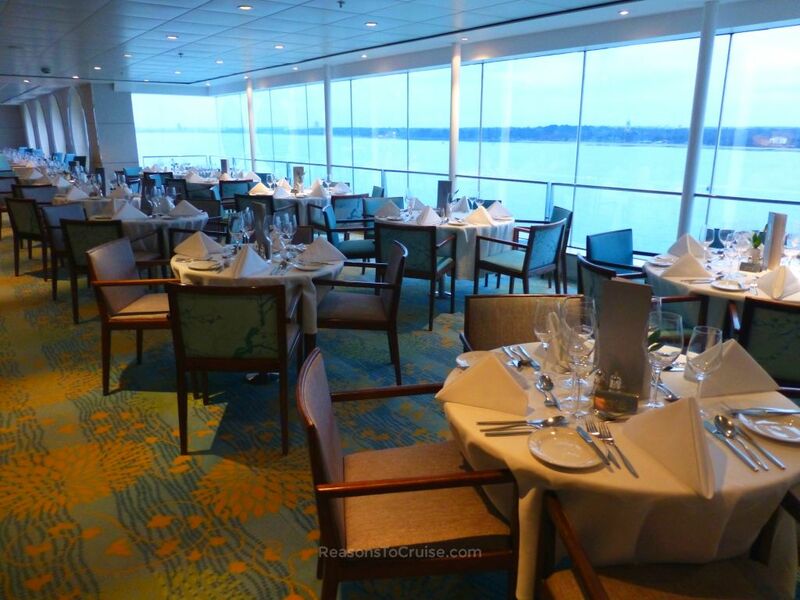 On a cruise, three meals a day is often just the starting point. Between 11 pm and midnight each night the Palms Café hosted a Supper Club. I expected this to be similar to a midnight buffet found on the larger ships, but it turned out to be a standard meal service, presumably for those that found themselves with the late night munchies. Outside of meal times, there were a couple of options, besides room service, for light nibbles. I had previously written about the extensive chocolate menu at the Bookmark Café and looked forward to sampling a few treats. Hovering at between £0.65 to £0.85 per chocolate they are not cheap but I dare anyone to resist the temptation. Who can resist a great cup of coffee and a couple of chocolates? 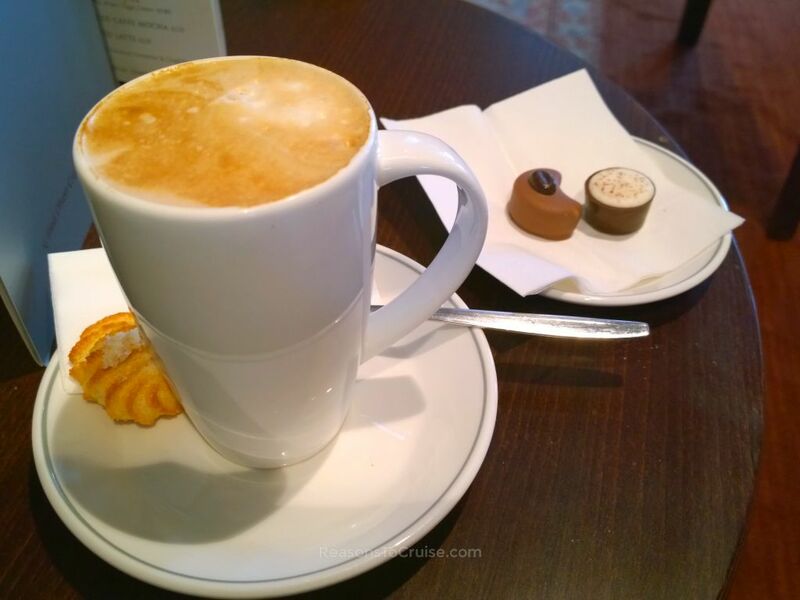 As a coffee and chocolate lover, I opted for the 'Mont Blanc Cappuccino', a coffee truffle wrapped in a dark chocolate cup covered with a "cappuccino froth", and the 'Matterhorn Moccatine', a roasted coffee truffle covered in milk chocolate and decorated with a coffee bean. While they tasted of good quality chocolate, I would have preferred a more intense flavour. The treats were, however, a perfect accompaniment to my Taylors of Harrogate caffè latte which cost a respectable £2.10. 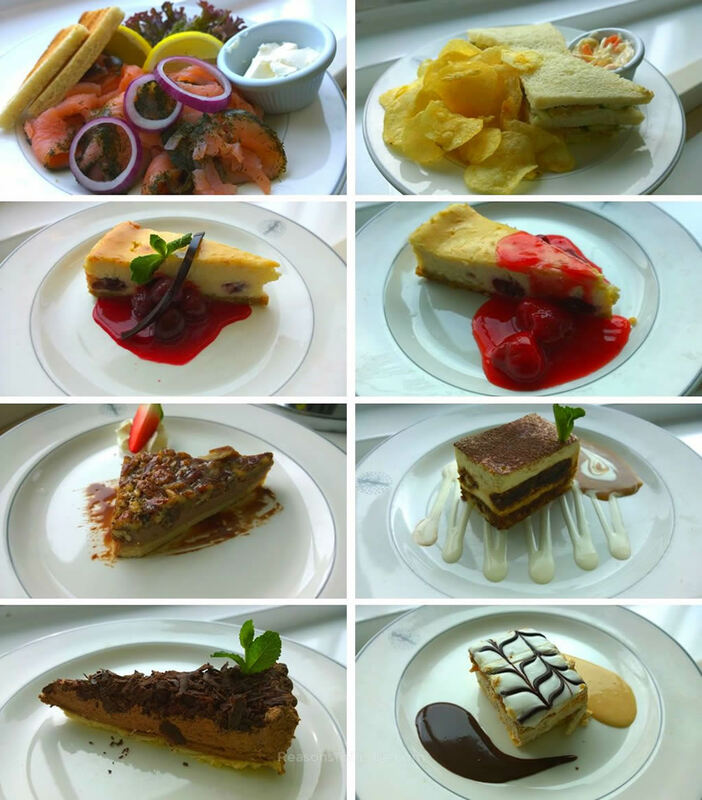 For £7.95 a luxurious afternoon tea experience was offered daily in the Observatory Lounge. The experience was somewhat popular. Those in search of liquid refreshment could find plenty of bars on Balmoral and even a traditional British pub (the Morning Light Pub), which on one occasion served up a classic pub lunch. Each bar had its own opening hours but venues opened as early as 10 am and continued serving customers until as late as 2 am. Find out more about the facilities on-board Balmoral here° and you can find upcoming itineraries on Balmoral here°. What do you think of the food described above? Would it tempt you onto a Fred. Olsen cruise sailing? Leave a comment below. You won’t find pretentious food on Fred. Olsen’s Balmoral. Instead, expect wholesome dishes cooked to perfection. The menus offer a good choice of options. The chefs are proficient in catering for passengers with intolerances and allergies too.